#Sustainability, #CSR and #SDG engagement are natural areas for private, public, civil society partnerships. Yet, many partnerships fail to realize even a portion of the impacts envisioned by the partners. It’s not a roles and responsibilities thing. It’s a value thing. Too often partnerships start with energy, fanfare and optimism, but, unfortunately, end in lethargy, unmet potential and resentment. It doesn’t have to be this way. Front-end work that identifies meaningful value propositions for all partners, and includes an impact measurement framework that facilitates alignment, value and impact is what produces results, resiliency and longevity. 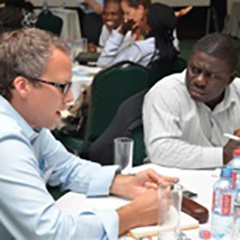 Sustainability and social impact are natural areas for partnerships between business, NGOs, governments and others. Shared interests emerge naturally, and the differences in capacity, experience and organizational mission create opportunities where value propositions, capacities and resources can be complementary rather than competing. Organizational diversity coupled with shared and overlapping purpose creates valuable opportunities for partners to advance their own agendas while creating social value and facilitating environmental stewardship. 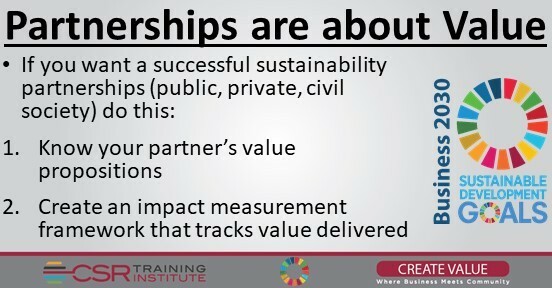 When partners know and understand exactly what each wants to gain from the partnership, why it is important, and how it can be measured and managed there is a foundation for long-term partnership sustainability and broad, meaningful impact. Business today is under increasing pressure to create social value, especially in areas such as health, education and poverty alleviation. Governments, NGOs and development organizations also prioritize social progress in these areas, especially with the growing pressure to deliver on the SDGs. While the goal of delivering social value is common to all these groups, the value they get from these efforts is often different. That is good. It creates situations where more value for one partner doesn’t mean less value for another. In this scenario value is cumulative, compounding and synergistic. All parties benefit from the difference in resources, skills and capacities that each partner brings to the table whether it be financial capacity, project management, infrastructure and reach, regulatory control or something else entirely. So back to the original question – Why do they often fail to deliver, or even dissolve in acrimony and anger? I’ve spent over two decades developing, working with and trying to salvage sustainability partnerships across many sectors around the world. I’ve found two issues are present in nearly all partnership failures and underperforming partnerships. And neither are about roles and responsibilities. When partners know, understand and accept what value is important to the other players on their team it makes the partnership more sustainable. It makes it easier to support each other’s interests. It makes it easier to identify and develop the synergies that create multiplier effects. When there is an impact measurement framework that partners agree to and understand, it enhances partnership performance and durability. When it tracks the delivery of self-interest and what is important to each partner it enables progress to be understood and optimized. Roles and responsibilities are important for sure. But, if you don’t know and understand the value propositions of your partners you can expect problems and frustration, even if the roles and responsibilities piece is executed perfectly. Here is a list of all the upcoming programs. As always if you have any questions about this article or would like to know more about how we can help your organization realize the benefits of CSR to your future business growth, please send me an email.